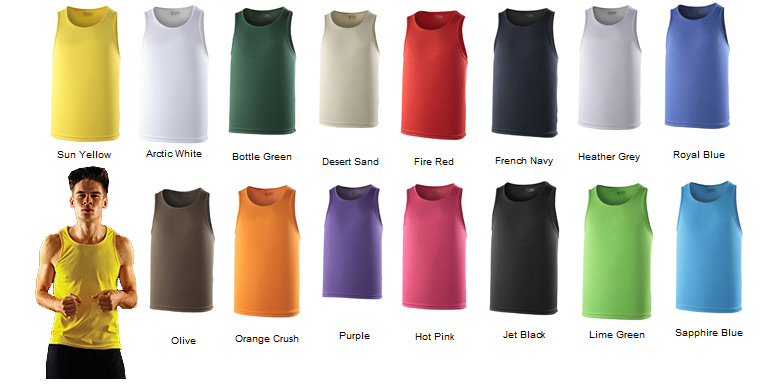 If you looking for sports vest which are ideal for those work outs then now we are offering in 15 great colours AWD cool Vests. These tops are made from Just cool’s own Neoteric™ textured fabric with inherent wickability. Enhanced fitting. Self fabric binding. Curved back hem. Printed back neck. These tops are Worldwide Responsible Accredited Production (WRAP) certified production. They also have Printed back neck. Sizes availability: S - 38", M - 40", L - 43", XL - 45", XXL - 48"